The Bee Group has been helping sales organizations maximize sales performance and achieve extraordinary sales results since 1996 by using a blend of methodology, experience and technology. Some of our clients have achieved a 35% increase in sales bookings in less than a year. We are a team of highly qualified professionals with expertise in sales effectiveness and organizations change. The Bee Group works with clients in the United States, EMEA, Canada, Latin America, Australia and the Caribbean. We specialize in Target Account Selling supported in Salesforce.com. Over the past 25 years, Target Account Selling has become a standard in the sales world, with more than 1,000,000 sellers trained. 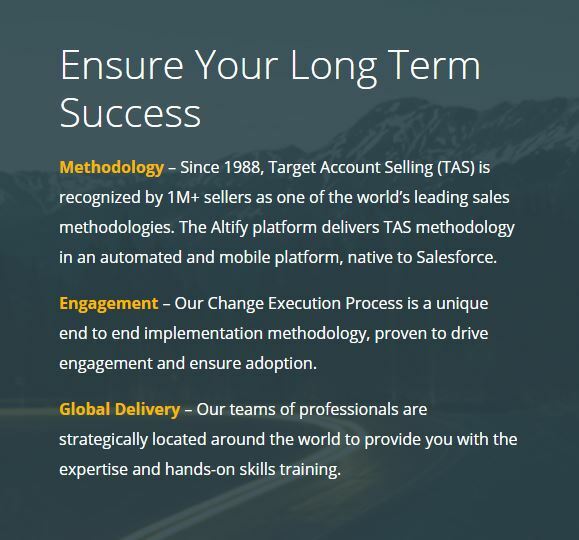 With Altify, Target Account Selling is automated via Salesforce, making it easier to integrate with existing workflows. Our unique value is the result of combining two disciplines; (1) intelligent software applications, and (2) deep sales methodologies. Innovation is at the core of our efforts and the intelligent software application is the engine driving revenue growth for our customers. Specialties: Expert in Sales Effectiveness, Target Account Selling, Sales Process, Account Management, Salesforce.com, High Performance Work Systems and Organizational Development. The Bee Group is a trusted Certified Partner of Altify, formerly The TAS Group. Altify makes it easy and intuitive for sales teams to apply Target Account Selling sales methodology to grow revenue and make their customers successful. We infused 30 years’ sales knowledge and sales insights into the Altify sales management software platform (previously called Dealmaker). Now enabled with real-time coaching, insights and notifications through Altify Max, sellers can uncover their customer’s problems first, win the deals that matter, increase wallet share in existing customers, and manage overall sales team performance. As a Certified Partner of Altify, we bring the full compliment of Altify Resources and Services to our clients. Our engagements are managed by an Altify Project Manager, Facilitator, Software Team and Account Executive so our clients can focus on their business. Once we have completed the initial Training-Project we will continue to follow up with a dedicated Altify Customer Success Manager to make sure the expected results are achieved. The Bee Group has 100+ Clients from a wide range of industries. Bruce, a business partner of The TAS Group, bid on a sales performance improvement initiative for one of ESR’s clients. Bruce won the business as a result of some very effective selling. Once he engaged with the client, he commenced process re-engineering work with the management team. ESR was very impressed with how Bruce worked with the team, and what was accomplished. Bruce delivered the training as well, to rave reviews from the CEO all the way down to the individual sales reps.
For each of the roles Bruce played (salesperson, consultant, trainer, advisor, coach), he did a stellar job. Bruce has an unusually effective blend of experience, intelligence, credibility, drive, presence and a deep understanding of what it takes to win in today’s very competitive B2B environment. Bruce Ellis is a rare example of strategist, communicators, sales professional, technologist, and consultant all rolled into one. Bruce understands that long term business relationships work, and what you get out in the end is directly related to how much you commit to the business relationship and the start, in the middle, and on-going. His commitment to his customer is impressive, as is his drive to ensure that every engagement in which he is involved delivers value to all of the stakeholders. We are proud to have Bruce as a business partner of Altify. When they ask, “Who do you really want in the fox-hole with you?” HP is at the top of my list. He is a truly decent and engaging person who always makes everyone else on the team better. HP is extremely thorough and has a rare gift for simplifying complex problems in a way that quickly cuts through the chafe, and leads to efficient and practical solutions. I always learn something new when I work with or for HP on a project. Of the many strategic approaches/tactics we used to drive sales growth in our organization, none increased the overall “win” rate as much as the coaching/consulting Bruce and The Bee Group brought to the table. The overall approaches used by Bruce were specifically tied to our business where the Team could better understand “why” and “how” they could tie our solutions to the customer needs while clearly differentiating ourselves from the competition. When used in our sales opportunities, we quickly noticed an uptick in our win rate against our competitors. I would recommend Bruce and his services to any organization and would hire him again without hesitation. Bruce is one of the most insightful and knowledgeable consultants I’ve ever had the pleasure of working with. He helped me turn around my orgagnization’s performance and having partnered with him in similar situations after that, I know that our success wasn’t by chance. He knows the theory and the practice of change management extremely well. HP is a highly motivated and knowledgeable professional, skilled in all business areas related to organizational management, sales, consulting for large organizations, leading complex technical projects and managing multiple teams. Copyright ©2019 Bee Group, Inc.